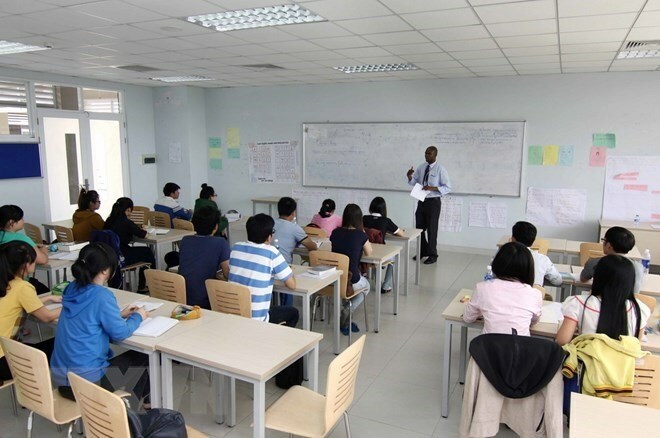 An English class at Eastern International Univeristy in southern Binh Duong Province. Educational experts think that the key goal is to address obstacles in the relations between the State and private sector to reduce pressure on public universities. Vietnam’s education strategy in the 2009-2020 period aims to expand private higher education institutions so that 40 percent of students select private universities. However, this target seems out of reach as in recent years, the number of students enrolling in private universities has kept declining. It is estimated that currently only 15 percent of students nationwide register for private higher education. A lot of majors at private universities no longer exist because they did not enroll enough students. Vietnam’s experiences run counter to an emerging trend in developing countries in which public education investment drops and private education grows. Nguyen Dieu Thanh, principal of State-owned Quang Binh University, said that there was a common perception among Vietnamese people that public universities are better than private ones. Changing the mindset of society on that issue is difficult and will take time. “Private universities must have their own unique features and outstanding training quality to compete with public institutions,” she said. Another weakness of private universities was lacking a long-term vision. This had posed a challenge for private universities and explained why many, despite being established a long time ago, were still unable to create their own “brand”, she said. According to educational experts, private universities have grown in number but remain low-quality. Weak academic standards and lecturers along with poor infrastructure pose big obstacles for these private institutions. Professor Dang Ung Van, from Hoa Binh University, said that a large number of public and private universities which were newly established or upgraded from colleges contributed to an excess in slots for students. This meant low-ranked universities struggled to attract students. Some universities were willing to accept students simply because they had graduated from high school. Associate Professor Nguyen Huy Vi from the University of Social Sciences and Humanities of the Vietnam National University, HCM City, said that unclear, irrelevant and difficult legal requirements would prevent investors from making investments in private higher education. According to Dr Dang Van Dinh from the Association of Vietnam’s Universities and Colleges, resolving difficulties for private universities is an urgent task and a vital solution to develop higher education in Vietnam. “The State should grant the private sector equal preferential opportunities as its public peer. Investors in private universities should be allowed to have the right to select their own management model and invite other sides to join the management council,” he said. “Privatising higher education is considered to be the only and the best solution to reduce financial pressure on State budget. The private education sector helps diversify training programmes and create competitiveness with the public sector,” he said. Associate Professor Nguyen Huy Vi said that the role of the State should be changed from one of management to supervision. The State should set up policies to manage higher education and create an equal playing field for public and private universities. Both public and private higher education must operate in an open and transparent manner, following quality assessments and ranking, he said.